We report that OX40 stimulation drives all lineages of CD4 T cell development, including regulatory T cells (Tregs), and the plasticity of the response is dependant on local cytokines. In TGF-β1-treated cultures, an OX40 agonist increased IFN-γ and IL-4 production and diverted T cells from the Treg lineage. However, cytokine blockade in the context of OX40 stimulation promoted enhanced Treg accumulation. This observation was evident in naive mice, as OX40 engagement enhanced Treg proliferation and accumulation in vivo. Lastly, OX40 agonist administration influenced experimental autoimmune encephalomyelitis disease severity in opposing directions, depending on the timing of administration. Given during Ag priming, the OX40 agonist drove Treg expansion and inhibited disease, whereas given later it enhanced T cell effector cytokine production in the CNS and exacerbated disease. Hence, OX40 signaling can augment the accumulation of all CD4 T cell lineages; however, its accentuation of immune responses may have vastly different biologic outcomes depending upon the local cytokine milieu. Ligation of OX40, a costimulatory molecule transiently expressed on recently activated T cells, is known to augment effector T cell expansion, function, and survival (1, 2); however, the biological role of OX40 signaling on regulatory T cells (Tregs)3 is not fully clear. Although, Tregs constitutively express OX40 on their surface (3, 4), the generation of thymic Tregs was not significantly influenced by OX40 signals (4). In contrast, OX40 stimulation was shown to prevent inducible Treg conversion of effector T cells in the presence of TGF-β1 (3, 4). The OX40-imparted resistance to TGF-β1-mediated Treg conversion appears to be the result of IL-4, IL-6, and IFN-γ produced by OX40-stimulated T cells (5, 6). We sought to further understand the mechanisms underlying the ability of OX40 signaling to prevent Treg conversion, as well as explore the relationship between OX40 and Treg proliferation. In vitro experiments demonstrated the ability of OX40 to block TGF-β1-mediated Treg conversion of activated T cells through enhanced production of Th1/2 cytokines. In the absence of IFN-γ and IL-4, agonist-OX40 stimulation enhanced the accumulation of Tregs. These data suggested that OX40 induced Treg expansion, and this was confirmed in vivo, where the administration of OX40 agonists to naive mice elicited Treg proliferation. Finally, OX40 agonist administration expanded Tregs if given during priming in an experimental autoimmune encephalomyelitis (EAE) model, which led to a decrease in disease severity. In contrast, if OX40 agonist administration was delivered at the onset of disease when effector T cells had already infiltrated the CNS, we observed increased effector cytokine production in the CNS and an increase in disease severity. Thus, it appears that the local cytokine milieu generated during an immune response ultimately determines the fate of CD4 T cell linage after OX40 stimulation, which subsequently enhances the expansion of all T cell lineages, including Tregs. Female C57BL/6, SJL, IFN-γ−/−, and FoxP3eGFP knock-in mice (where eGFP is enhanced GFP) 6 to 8 wk of age were used in accordance with the appropriate institutional guidelines and committees. CD4+CD25− T cells were isolated from lymph nodes (LNs) by MACS depletion of CD25+ and CD4− cells (97% pure) (Miltenyi Biotec). Enriched T cells were cultured with 20 U/ml IL-2 and TGF-β1 (2 ng/ml in the 24-well plates or 1 ng/ml in the 96-well plates) and activated with plate-bound anti-CD28 (2 μg/ml) and anti-CD3 (2.0 μg/ml in 24-well plates or 0.5 μg/ml in 96-well plates). Anti-OX40 (IgY), previously shown to activate OX40 and induce IL-12R (7) (10 μg/ml in 24-well plates or 5 μg/ml in 96-well plates) and blocking IL-4, IL-6, and IFN-γ Abs at 0.5 μg/ml/Ab (eBioscience) were added. Cultures were harvested after 72 h and cells were stained for CD4, CD25, and FoxP3 (eBioscience). Cells from spleens of FoxP3eGFP CD45.2 mice were stained with allophycocyanin-CD4 and DAPI (Invitrogen) and sorted by DAPI−CD4+GFP+ or GFP−. Purified populations (>97% purity) of Tregs (GFP+) or CD4+ T cells (GFP−) were adoptively transferred into CD45.1 mice at 106 or 5 × 106 respectively. Mice received 500 μg of anti-OX40 (OX86) or rat IgG, and splenocytes were analyzed by FACS (day 6). The assays were performed as previously described (8). Mice were treated with (500 μg) of anti-OX40 or rat IgG i.p. Splenic CD4+CD25+ Tregs were purified by MACS (day 6) and mixed with CFSE-labeled (1 μg/ml), MACS-purified Thy1.1 CD8+ T cells at various ratios in the presence of 1 μg/ml plate-bound anti-CD3. After 96 h, T cell proliferation was analyzed. SJL mice were injected in the flanks with a 200-μl emulsion containing 150 μg of proteolipid protein (PLP)139–151 (NeoMPS) with an equal volume of CFA (200 μg of Mycobacterium tuberculosis) (day 0). Mice were divided into three treatment groups: 1) 200 μg of rat IgG (days 0 and 4); 2) 200 μg of anti-OX40 (days 0 and 4); and 3) 200 μg of anti-OX40 at disease onset and 2 and 4 days later (i.p.) and monitored daily for disease according to a six-point scale: 0, healthy; 1, limp tail or mild hind limb weakness; 2, moderate hind limb weakness; 3, moderately severe hind limb weakness; 4, severe hind limb weakness; 5, paraplegia with no more than moderate forelimb weakness; and 6, moribund condition. Spleen and LNs were prepared by homogenizing the tissue through fine mesh screens. Cells from the CNS were obtained as previously described (9). Cells were analyzed by FACS for CD4, CD25, and FoxP3. Additionally, 4 × 106 spleen and LN cells/well (24-well) or 105 brain cells/well (96-well) were restimulated with 10 μg of PLP139–151 for 48 h. Supernatants were collected and analyzed for cytokines using a Luminex Bio-Plex kit (Bio-Rad). The effect of an agonist OX40 Ab (anti-OX40) on TGF-β1-mediated Treg generation was studied by stimulating naive enriched FoxP3−CD4+ T cells with anti-CD3 and anti-CD28 in the presence of IL-2 and TGF-β1 (3, 10). Anti-OX40 or rat IgG was added to cultures and Tregs were assessed after 72 h. As previously seen (3, 10), OX40 stimulation decreased the percentage of Tregs (FoxP3+) (Fig. 1⇓A). To determine the role that differentiating cytokines played in the OX40-mediated decrease in Treg conversion, blocking Abs to these cytokines were added. IFN-γ and IL-4 have been shown to impart resistance to TGFβ-1-mediated Treg conversion (11), and the inflammatory cytokine IL-6, in conjunction with TGF-β1, directs Th17 differentiation (12). The addition of blocking IL-4, IL-6, and IFN-γ Abs to cultures stimulated with anti-OX40 increased the frequency of FoxP3+ T cells compared with TGF-β1 treatment alone (38.5% to 55.1%) as well as the number of Tregs, as total cell numbers from Treg cultures were not statistically different (0.60 × 105 ± 0.08 vs 0.70 × 105 ± 0.03) (Fig. 1⇓, A and B, and data not shown). Furthermore, the presence of either IFN-γ or IL-4 in culture prevented the OX40-enhanced TGF-β1-Treg accumulation, but not the presence of IL-6 (Fig. 1⇓C). Analysis of the culture supernatants revealed that anti-OX40 stimulation significantly increased the production of both IFN-γ and IL-4 (Fig. 1⇓D). Both OX40 stimulated and control cultures displayed similar levels of IFN-γ -producing T cells (data not shown), suggesting that OX40 stimulation enhanced the amount of IFN-γ on a per cell basis and not the frequency of cells that differentiate to IFN-γ-producers. In addition, to further understand the role of IFN-γ blocking Treg development in the presence of anti-OX40, IFN-γ-deficient T cells were cultured with TGF-β1 (2 ng/ml) and anti-OX40, with blockade of IL-4 (via anti-IL-4). Various doses of exogenous IFN-γ were then added and Treg conversion was measured. The concentration of IFN-γ needed to reduce Treg conversion was 4-fold less than that of TGF-β1 (0.5 ng/ml vs 2 ng/ml) in these cultures, suggesting this ratio (IFN-γ:TGF-β1 = 0.25) may delineate the effect of OX40 stimulation expanding Tregs or reducing their conversion. These results demonstrate that OX40-imparted resistance to TGF-β1-Treg conversion is mediated in part by increasing Th1/2 differentiation cytokine production; but more importantly, OX40 stimulation appears to drive Treg accumulation in the absence of these cytokines. The cytokines IFN-γ and IL-4 determine the effect of OX40 stimulation on activated T cells in the presence of TGF-β1. Isolated CD25−FoxP3− T cells were stimulated by anti-CD3 and anti-CD28 in the presence of IL-2. A, Cultures were then treated with TGF-β1 and/or the agonist OX40 Ab (αOX40) and incubated for 72 h. B and C, Blocking Abs specific for IL-4, IL-6, and IFN-γ (B) or combinations of IL-4, IL-6, and IFN-γ Abs (C) were added to cultures (where the prefix α- represents anti-). D, Levels of IFN-γ and IL-4 from cultures (72 h). E, Increasing doses of IFN-γ was added to IFN-γ−/− T cell Treg cultures treated with TGF-β1 (2 ng/ml), IL-2, anti-OX40 (αOX40), and anti-IL-4 (αIL-4). The frequency of FoxP3+ cells was assessed 72 h later. The findings that OX40 stimulation appeared to drive Treg accumulation in the absence of Th-differentiating cytokines (Fig. 1⇑B) prompted investigations into the relationship between OX40 stimulation and Treg proliferation in naive mice. Because of the transient nature of OX40 expression on activated T cells, administration of anti-OX40 to naive mice likely engages constitutively expressed OX40 on Tregs. A single injection of anti-OX40 increased the numbers of FoxP3+ Tregs 4-fold in the spleens in a dose-dependant manner when compared with controls 6 days after injection, the peak of the response (Fig. 2⇓, A and B). To determine whether anti-OX40 enhances the proliferation of both natural Tregs and inducible TGF-β1 Tregs (iTregs), we assessed Ki-67 expression, a marker of dividing cells. TGF-β1-iTregs, generated as previously described, were transferred into congenic recipients (Thy1.1) and then treated with anti-OX40 or rat IgG. Six days later, both OX40-stimulated transferred iTregs (Thy1.1−) and endogenous natural Tregs (Thy1.1+) expressed increased Ki-67 compared with IgG controls (Fig. 2⇓C). To determine whether anti-OX40 stimulation expanded existing Tregs or induced new Tregs in naive mice, CD4+FoxP3+ and CD4+FoxP3− T cells were sorted from the spleens of naive FoxP3eGFP transgenic mice, transferred to naive congenic recipients, and injected with anti-OX40 or rat IgG. OX40 stimulation increased the frequency of transferred FoxP3+ T cells compared with controls, whereas Treg conversion of the transferred FoxP3− T cells following anti-OX40 treatment was minimal (Fig. 2⇓D). Collectively, these data show systemic agonist OX40 administration can expand CD4+FoxP3+ Treg populations in naive mice. Agonist OX40 augments the accumulation and cycling of functionally suppressive CD4+FoxP3+ T cells in vivo. A, Naive wild-type mice were injected with rat IgG or anti-OX40 (αOX40; 100 or 500 μg) i.p. and splenic CD4+FoxP3+ T cells were enumerated 6 days later. B, Splenocytes from mice injected with 500 μg of anti-OX40 (αOX40) were analyzed for CD4+FoxP3+ T cells at various times. C, TGF-β1-generated Tregs (106) (Thy1.2) were injected into Thy1.1 congenic hosts and treated with rat IgG or anti-OX40 (500 μg) 1 day later. Ki-67 expression was analyzed 6 days after treatment in Thy1.1+CD4+FoxP3+ and Thy1.1−CD4+FoxP3+ T cells. 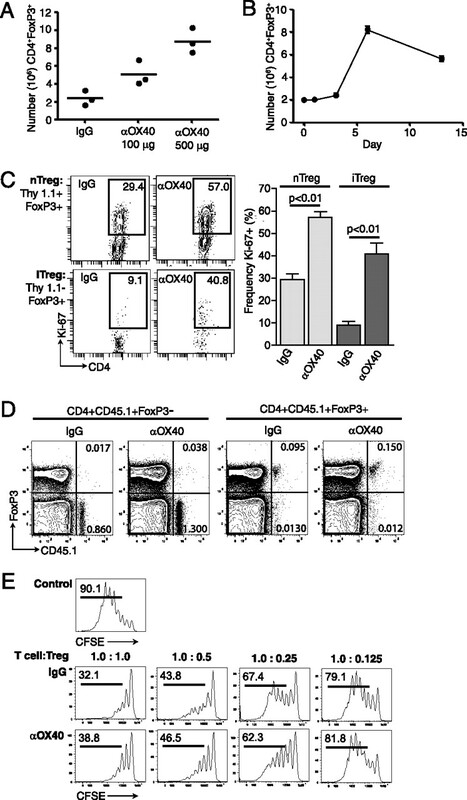 D, FoxP3+ and FoxP3− CD4 T cells were isolated by FACS sorting from FoxP3eGFP spleens by gating for CD4+GFP+ and CD4+GFP−, respectively. FoxP3+ T cells (106) or FoxP3− T cells (5 × 106) were transferred to CD45.1 congenic mice and treated with rat IgG or anti-OX40 (500 μg). Spleens were analyzed for CD45.2+FoxP3+ T cell expansion (day 6). E, Isolated CD4+FoxP3+ T cells (50, 000) from the spleens of mice 6 days after rat IgG or anti-OX40 treatment were mixed with naive CFSE-labeled CD8 T cells and stimulated with anti-CD3. Two to three days later CFSE dilution was measured. It has been shown that OX40 engagement can abrogate the suppressive effects of Tregs. To determine whether systemic administration of anti-OX40 could abrogate the function of the expanded Tregs in naive mice, Tregs were isolated from anti-OX40- and rat IgG-treated mice and cultured with naive CFSE-labeled CD8 T cells at various ratios. After TCR activation we observed no significant differences in the suppression of T cell proliferation by Tregs from anti-OX40-treated mice compared with rat IgG-treated mice (Fig. 2⇑E). This result is in contrast to other studies showing that OX40-stimulated Tregs abrogated their suppressive function (4, 13, 14). An explanation for the divergent effects of OX40 signals seen on Treg suppression remains to be determined. EAE can be induced in mice by the administration of an associated myelin peptide, PLP139–151. In this model of autoimmunity, self-reactive CD4 T cells are primed in the draining LNs and then infiltrate the CNS, resulting in progressive paralysis 10–12 days after immunization. OX40 is selectively expressed on the pathogenic T cells isolated from sites of inflammation in the diseased CNS tissue (15), and increased OX40 signaling exacerbates disease severity (16). In contrast, blockade of OX40 signaling at disease onset ameliorates disease severity (17), suggesting that the key window of OX40 signaling in the pathogenesis of EAE appears to be when autoreactive T cells enter the CNS and re-express OX40 (18). The role of OX40 signaling during PLP priming, compared with disease onset, is less well known. Thus, experiments were performed in PLP139–151/CFA-immunized SJL mice that received anti-OX40 at either priming (days 0 and 4) or disease onset (day of onset, +2 and + 4 days). Mice receiving anti-OX40 at priming experienced amelioration of the disease, which was in contrast with mice receiving anti-OX40 at disease onset, when the clinical signs of disease were worse than those of controls (Fig. 3⇓A). Analysis of the PLP139–151-stimulated cytokine profile of lymphocytes isolated from CNS tissue on day 13 after priming revealed the contrasting effects of anti-OX40. T cells isolated from the CNS of mice administered anti-OX40 at disease onset produced greater levels of the pathogenic cytokines IL-2, IL-6, IL-17, and IFN-γ compared with T cells isolated from the CNS in mice administered anti-OX40 during Ag priming (Fig. 3⇓B). The timing of OX40-engagement in a model of EAE influences disease severity by alterations in Tregs. A, EAE disease progression and severity is decreased following anti-OX40 (αOX40) administration (200 μg) compared with rat IgG at Ag-priming (days 0 and 4), but anti-OX40 mediated an increase in severity when administered at disease onset (day of onset, day + 2 and + 4). B, Anti-OX40 (αOX40) treatment at disease onset increases IL-2, IL-6, IL-17, and IFN-γ produced by isolated CNS cells. C, Anti-OX40 (αOX40) treatment at PLP/CFA priming alters the frequency of FoxP3+ CD4 cells in the spleen and LNs of EAE mice after 7 days. Values of p ≤ 0.05 were considered significant and expressed as follows: ∗/#, p ≤ 0.05; and ∗∗, p ≤ 0.001. To understand the potential mechanism of disease amelioration mediated by the OX40 agonist at priming, Treg levels were assessed after immunization but before disease onset. It has been shown Tregs play a critical role in EAE disease amelioration and protection (19). To this end, LNs and spleens were harvested from anti-OX40- or IgG-treated mice 7 days after immunization, and Tregs were analyzed. OX40 engagement at Ag priming increased the frequency of both FoxP3+CD25+ and FoxP3+CD25− Tregs in both the spleen and LNs (Fig. 3⇑C), which was reflected in the total number of FoxP3+ Tregs found in the LNs (0.95 × 106 IgG vs 2.22 × 106 anti-OX40; p = 0.016). Thus, the increased ratio of Tregs in the anti-OX40-treated mice may have dampened immunity during priming, leading to a decrease in the development of self-reactive T cells that could initially enter the CNS and lessen disease severity. These findings resolve some of the inconsistencies regarding the effect of OX40 on Treg proliferation and peripheral Treg generation. Our data suggest that the makeup of the local cytokine milieu at the time of OX40 engagement can direct either resistance to Treg conversion or facilitate Treg proliferation. It is well established that differentiation cytokines antagonize the TGF-β1-mediated development of Tregs by imprinting Th1/2/17 phenotypes that supplant the formation of a Treg phenotype (11, 12). Enhanced production of differentiation cytokines from activated T cells by OX40 signaling appears to underlie the imparted resistance to Treg conversion. Yet, in a noninflammatory environment OX40 signals effectively drive the proliferation and expansion of functional Tregs. Simply put, OX40 signals tend to stimulate all CD4 T cell populations, and the enhancement of lineage development by OX40 signaling appears to be dependent on the local cytokine milieu. The implications for the perceived dichotomy in OX40 effects on Tregs are apparent in the initiation and progression of autoimmunity in the EAE model. Induction of the disease by priming with associate myelin-specific Ags and CFA not only drives autoreactive T cells but also produces conditions for increased Treg generation (20, 21). Thus, the administration of the OX40 agonist during priming resulted in the increased accumulation of Tregs and a coincident decrease in disease progression and severity. Conversely, enhanced OX40 engagement at the time of disease onset, when alterations in the CNS cytokine environment have already begun and the autoreactive T cells have broken the blood-brain barrier and re-expressed OX40, resulted in an increase in effector cytokines within the CNS and increased disease severity. In apparent contrast to the EAE results, OX40 stimulation at priming has also been shown to boost vaccine responses in general (22). The difference in OX40 action at priming in these two models may be explained by the use of CFA in the EAE model that has been shown to drive an inflammatory microenvironment in the LN, leading to increased numbers of Tregs (20, 21). Other potential reasons are differences in Ag affinity or amount of Ag; however a definitive explanation remains to be determined. In conclusion, the differential effects of OX40 signaling on Treg generation and proliferation appear to be established by the cytokines present at the site of T cell activation. Moreover, the data generated in the EAE model showed two different biologic outcomes when the same OX40 agonist was delivered just 10 days apart. We attribute these opposing effects to different immune environments (draining LNs and inflamed CNS) where the conditions drove two different biologic outcomes using the same immune stimulus. Thus, it appears that engagement of OX40 can augment all lineages of CD4 T cells, generating different biologic outcomes depending upon the influence from the local cytokine milieu. ↵1 C.E.R., M.A.Y., and D.H.-C. contributed equally to this work. ↵3 Abbreviations used in this paper: Treg, regulatory T cell; EAE, experimental autoimmune encephalomyelitis; eGFP, enhanced GFP; iTreg, inducible TGF-β1 Treg; LN, lymph node; PLP, proteolipid protein. Gramaglia, I., A. D. Weinberg, M. Lemon, M. Croft. 1998. OX-40 ligand: a potent costimulatory molecule for sustaining primary CD4 T cell responses. J. Immunol. 161: 6510-6517. Rogers, P. R., J. Song, I. Gramaglia, N. Killeen, M. Croft. 2001. OX40 promotes Bcl-xL and Bcl-2 expression and is essential for long-term survival of CD4 T cells. Immunity 15: 445-455. So, T., M. Croft. 2007. Cutting edge: OX40 inhibits TGF-β- and antigen-driven conversion of naive CD4 T cells into CD25+Foxp3+ T cells. J. Immunol. 179: 1427-1430. Vu, M. D., X. Xiao, W. Gao, N. Degauque, M. Chen, A. Kroemer, N. Killeen, N. Ishii, X. Chang Li. 2007. OX40 costimulation turns off Foxp3+ Tregs. Blood 110: 2501-2510. Duan, W., T. So, M. Croft. 2008. Antagonism of airway tolerance by endotoxin/lipopolysaccharide through promoting OX40L and suppressing antigen-specific Foxp3+ T regulatory cells. J. Immunol. 181: 8650-8659. Xiao, X., A. Kroemer, W. Gao, N. Ishii, G. Demirci, X. C. Li. 2008. OX40/OX40L costimulation affects induction of Foxp3+ regulatory T cells in part by expanding memory T cells in vivo. J. Immunol. 181: 3193-3201. Ruby, C. E., R. Montler, R. Zheng, S. Shu, A. D. Weinberg. 2008. 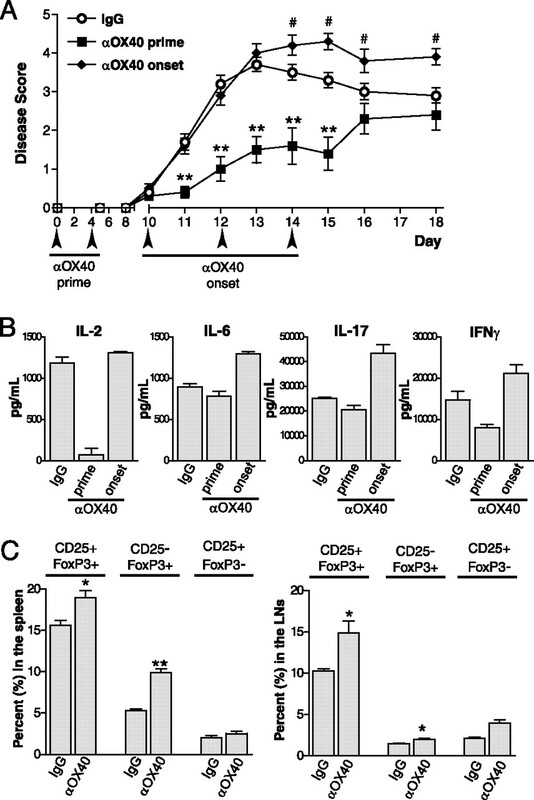 IL-12 is required for anti-OX40-mediated CD4 T cell survival. J. Immunol. 180: 2140-2148. Bebo, B. F., Jr, A. A. Vandenbark, H. Offner. 1996. Male SJL mice do not relapse after induction of EAE with PLP 139–151. J. Neurosci. Res. 45: 680-689. Wei, J., O. Duramad, O. A. Perng, S. L. Reiner, Y. J. Liu, F. X. Qin. 2007. Antagonistic nature of T helper 1/2 developmental programs in opposing peripheral induction of Foxp3+ regulatory T cells. Proc. Natl. Acad. Sci. USA 104: 18169-18174. Takeda, I., S. Ine, N. Killeen, L. C. Ndhlovu, K. Murata, S. Satomi, K. Sugamura, N. Ishii. 2004. Distinct roles for the OX40-OX40 ligand interaction in regulatory and nonregulatory T cells. J. Immunol. 172: 3580-3589. Weinberg, A. D., M. Lemon, A. J. Jones, M. Vainiene, B. Celnik, A. C. Buenafe, N. Culbertson, A. Bakke, A. A. Vandenbark, H. Offner. 1996. OX-40 antibody enhances for autoantigen specific Vβ8.2+ T cells within the spinal cord of Lewis rats with autoimmune encephalomyelitis. J. Neurosci. Res. 43: 42-49. Ndhlovu, L. C., N. Ishii, K. Murata, T. Sato, K. Sugamura. 2001. Critical involvement of OX40 ligand signals in the T cell priming events during experimental autoimmune encephalomyelitis. J. Immunol. 167: 2991-2999. Weinberg, A. D., K. W. Wegmann, C. Funatake, R. H. Whitham. 1999. Blocking OX-40/OX-40 ligand interaction in vitro and in vivo leads to decreased T cell function and amelioration of experimental allergic encephalomyelitis. J. Immunol. 162: 1818-1826. Sugamura, K., N. Ishii, A. D. Weinberg. 2004. Therapeutic targeting of the effector T-cell co-stimulatory molecule OX40. Nat. Rev. Immunol. 4: 420-431. O'Connor, R. A., S. M. Anderton. 2008. Foxp3+ regulatory T cells in the control of experimental CNS autoimmune disease. J. Neuroimmunol. 193: 1-11. Qin, H. Y., M. W. Sadelain, C. Hitchon, J. Lauzon, B. Singh. 1993. Complete Freund’s adjuvant-induced T cells prevent the development and adoptive transfer of diabetes in nonobese diabetic mice. J. Immunol. 150: 2072-2080. Scott-Browne, J. P., S. Shafiani, G. Tucker-Heard, K. Ishida-Tsubota, J. D. Fontenot, A. Y. Rudensky, M. J. Bevan, K. B. Urdahl. 2007. Expansion and function of Foxp3-expressing T regulatory cells during tuberculosis. J. Exp. Med. 204: 2159-2169. Cuadros, C., A. L. Dominguez, P. L. Lollini, M. Croft, R. S. Mittler, P. Borgstrom, J. Lustgarten. 2005. Vaccination with dendritic cells pulsed with apoptotic tumors in combination with anti-OX40 and anti-4-1BB monoclonal antibodies induces T cell-mediated protective immunity in Her-2/neu transgenic mice. Int. J. Cancer. 116: 934-943.